This week's Thrifted Kitchen is perfect for those of you hosting an upcoming Halloween bash. 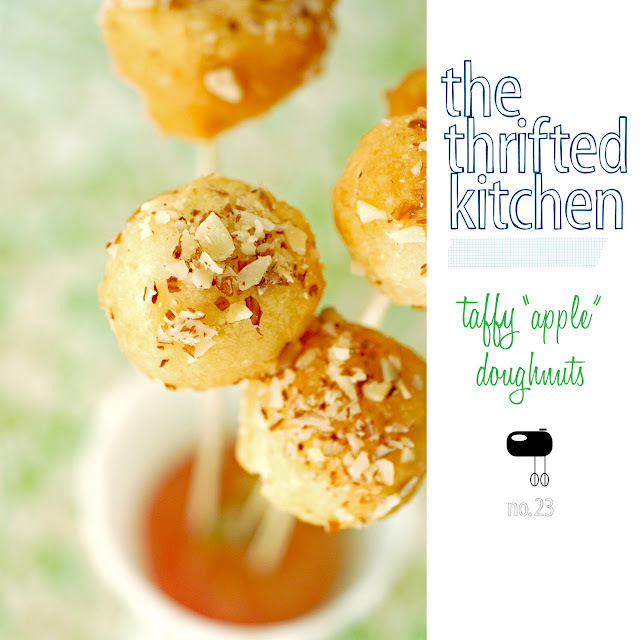 It's a really clever take on taffy apples that's easy to whip up and comes from Mrs. Albert Krauthamer of Indianapolis, who was the senior winner in the "breads" category of Pillsbury's 5th 100 Grand National Recipes booklet from 1954. In the photo they show the doughnuts on short skewers, which are then pushed into apples that are sitting in a bowl (cute), and Mrs. Krauthamer suggests serving them with mugs of apple cider (yum). 1/2 cup sugar, creaming well. Drop :: by rounded teaspoonfuls into hot deep fat at 350 degrees (I used vegetable oil). Fry until golden brown, 3 to 4 minutes. Drain on absorbent paper. 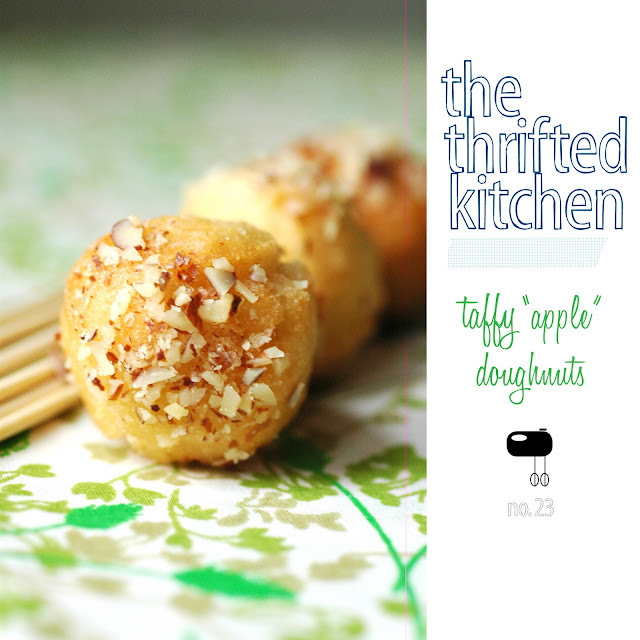 Insert :: a wooden skewer or stick firmly into each doughnut ball. Dip each doughnut into hot honey syrup, then sprinkle with finely chopped nuts. Place on wire rack to cool thoroughly. Combine 3/4 cup honey and 3/4 cup firmly packed brown sugar in saucepan. Bring to boil. Reheat if syrup becomes too thick. ohhh these look delish! I want some right now.